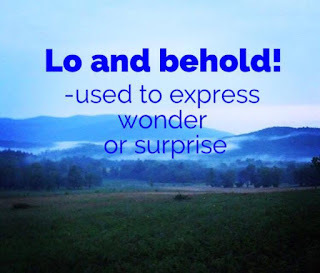 Today's phrase, lo and behold, is one that is used frequently by my Granny. 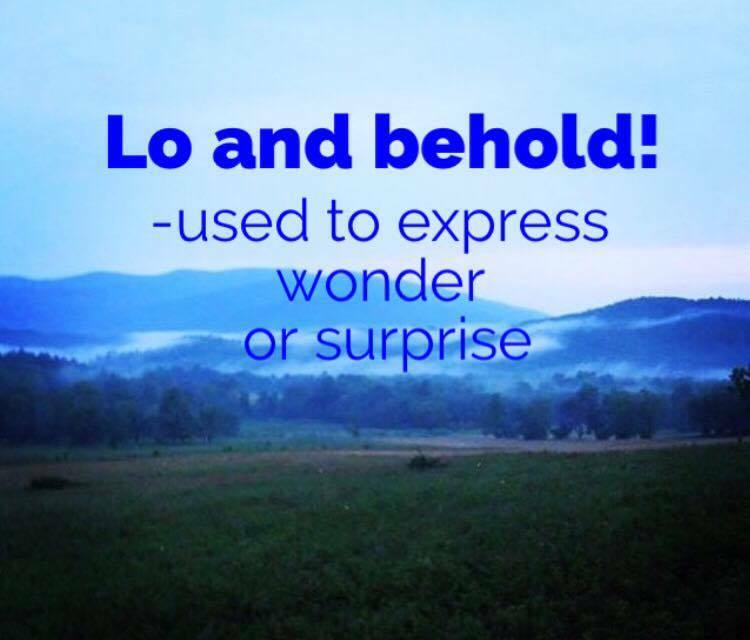 It seems that she can't tell a story without throwing a "lo and behold" in here and there. It's a phrase that you use when you want to express that you couldn't quite believe that something happened. Example: The weatherman said we were going to get a good snow and that we needed to make sure we were prepared. I decided to go to town to get a few things and, lo and behold, there wasn't a loaf of bread to be found for 30 miles! This is a great phrase to use when you're trying to exaggerate a point in a story that you're telling. It helps express your excitement a little better. "Hartington...had just told us how hard he had worked all the morning...when, lo and behold! M. Deshayes himself appeared." Now, thanks to Granny, several of us are using the term in everyday conversations. We all like to talk *ahem* and tell stories when we're all together and we like them to be as exciting as possible. I believe my Dad and his brothers like to try to outdo each other once they get started. They can't hold a candle to Granny or Pa though. Granny also usually ends her stories with "and that's the end of that bear tale!". Have you heard this phrase used in your neck of the woods?